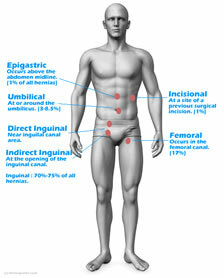 Inguinal (pronounced 'ingwinal') Hernias are very common - 20% of the male population can expect to have a hernia at some point during their lives. The treatment nearly always requires surgery but the actual time that a patient decides to have the surgery is a matter of debate. Providing the hernia is reductible i.e. can be pushed back gently and does not cause undue discomfort many patients with a hernia decide for various reasons to postpone hernia surgery. Post diagnosis a hernia can be controlled and even eliminated by a combination of gentle exercise, dietary regime change and an awareness of what is or not possible with a hernia in-situ.